This is our answer to the 'fire ring', with advantages. the 30 inch square campfire grill gets staked into the ground so it cannot be moved, yet flips back for easy clean-out. 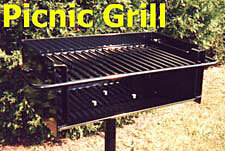 This all-welded unit is constructed of 11-gauge hot-roll steel and 1/2 inch solid steel grill bars. 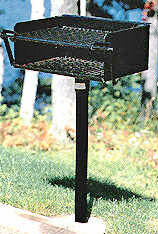 Aqualand Campfire Grills are available in any quantity. 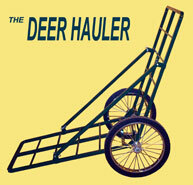 Great for hauling camping and hunting supplies. This heavy duty charcoal grill is one of the strongest, most functional units in the industry. This style grill can be found at highway rest areas across the country. The cooking surface adjusts to four heights and can be tipped back for easy access. The fire box is permanently attached, but can be swiveled 360 degrees. 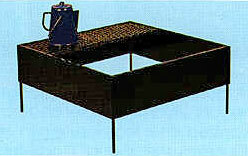 The grill is available in stationary or portable models. Ideal for both commercial and residential applications. Similar to the Deluxe Pedestal Grill, the Picnic Grill, however, is lighter weight and is designed for temporary applications. It has a cooking surface that adjusts to four heights and can be tipped back for easy access. The fire box is permanently attached, but can be swiveled 360 degrees. The pedestal is designed to be cemented into the ground, yet the grill is removable for off season storage. Powder Coat black with pipe.